The current state of your password management is probably intolerable, with Post-It notes, random pieces of paper, or other primitive tracking methods to keep track of multiple logins, sites, and credit card information – and we do this to keep our personal and professional lives in order. It’s almost like you’re dying to get hacked into or locked out of your accounts. Oh, and don’t you love it when you’re prompted, almost randomly, to change your password? At some point you start running out of colors, farm animals, and the names of friends and nephews, to integrate into a string of lower-case, upper-case, number, astrological sign, and special characters. I have several passwords that I have to manage and it’s such a freaking nightmare. such as databases for my case notes, websites that I manage, my twitter accounts (plural). personal and professional emails, and every single web app that I used to enhance or better my life. Every so often, we hear in the news about a very massive security breach involving our credit cards, passwords, identity, and so forth. Technology appears to be a necessary thing, but it can be a headache when we have to clean up these messes. Recently, it was discovered that the way everything is “securely” transferred via the Internet had a huge hole in it and that we have to change all of our passwords for certain sites. In spite of any catastrophic incident or breach of security, it’s always good practice to secure sensitive information. There are several ways LifeHacker has this article to help you understand the nuances of creating a good password. If you have trouble making a password, there is software that can help you with that! I highly recommend 1Password, an app that I use on a daily basis to manage and secure 200+ pieces of sensitive information. 1Password is a multi-platform application that I use on OSX (my Macs) and iOS (iPhone and iPad). If you have a Windows machine or Android phone or tablet, it works there too. I love that I can be on one machine, enter (or update) a log-in and (or) password, and have my database immediately update so when I log on with a different device, my information is always up-to-date. On OSX and iOS, the database lives in iCloud and is updated immediately. … [Y]our data is encrypted using AES, the same state-of-the-art encryption algorithm used as the national standard in the United States. 1Password uses 128-bit keys for encryption, which means that it would take millions of years for a criminal to decrypt your data using a brute force attack. 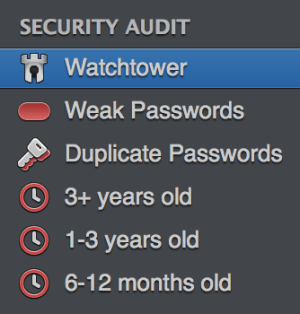 Recently, 1Password’s Mac application was updated to include a function called Watchtower. This function provides users with information on which passwords a person should change based on vulnerability, length of existence, and whether or not the log-in/password was subjected to the Hearbleed attack. I use 1Password to manage everything that I don’t want living in my Evernote, Dropbox, email, or Post-It note. Secure Notes: Sensitive information that l don’t want to put in aforementioned venues. Bank Accounts: Account numbers, routing numbers, and other vital information for places where I store my hard earned money. Wireless Routers: Router name and passwords for the wireless network routers of friends/family whom I visit. Driver’s Licenses: The information that’s on my Driver’s license that I might need at a later time. Quick Tip: If you use Google Chrome (seriously, why aren’t you doing that!?) on a desktop computer and you have the desktop version of 1Password, there is a plug-in that makes it easy to log into websites where Chrome can pull your password from your database and plug it in to the log-in page to log into a site. Quick Tip: In managing my content on the app, I will include the number to call for customer service, in case I ever have to report a stolen or lost credit card right away. Question everything that asks for your passwords. How are you careful with your passwords and other sensitive information?